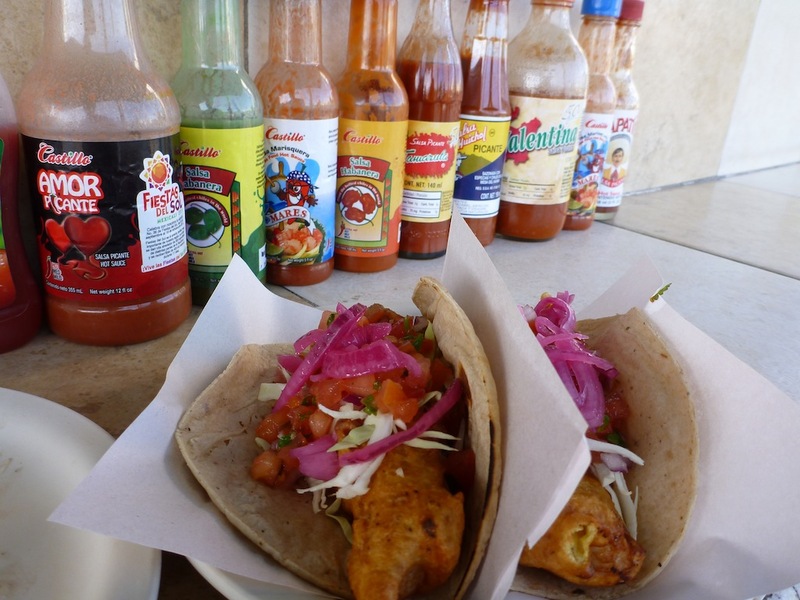 Fish Tacos. HAHA you are SO jealous right now! Quite possibly the easiest, most unsecured border crossing in the world is crossing on foot from the US to Mexico at the Tijuana crossing. You just walk right in. There are no guards, no guns, no dogs, no queues and no passport controls. There isn’t even a guy to nonchalantly wave you through. You just walk right in. Mexican customs, on the other hand… Well, let’s just say that Mexican customs is to comedy what Australian customs is to tragedy. The only thing that takes place (and you could walk right by it if you are not paying attention) is a casually dressed lady standing by a red/green light (like a traffic signal) asks you to press the button to make the light green. 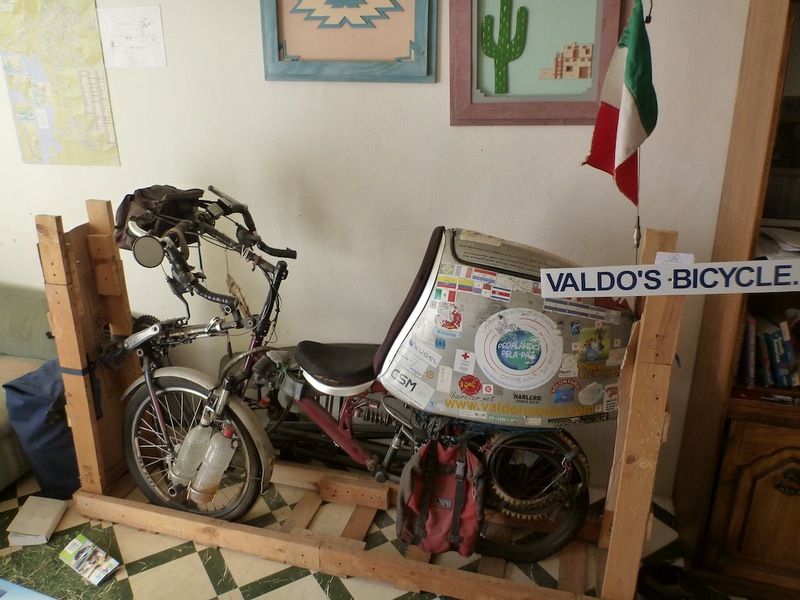 Mexican Customs. Suddenly, Tony and I were in Mexico. It was already about 3 PM by the time I pointed Tony in the right direction and started grinding the gears. The plan was to get out of Tijuana and make it to the coast and find a place to camp on the beach before it got dark, maybe somewhere south of Rosarito or Puerto Nuevo. That didn’t happen. Instead, a pickup truck pulled over in front of me and a guy got out and asked me if I needed a place to crash for the night. I did. So. a minute later, Tony was loaded into the back, and Mike and I were chatting up front while we cruised down the coast to his beach house trying to find something to open a couple of bottles of Stone Brewery beer with. When the toll booth attendant failed to find a bottle opener, lighter, or similar for us, Mike pulled out his keys and managed to find a suitable alternative. Cheers. Mike is a man living life on his own terms. He makes his living bending sheet metal north of the border; getting paid American union wages. Then he goes home to his simple and comfortably sized two-bedroom beach house just south of the border. 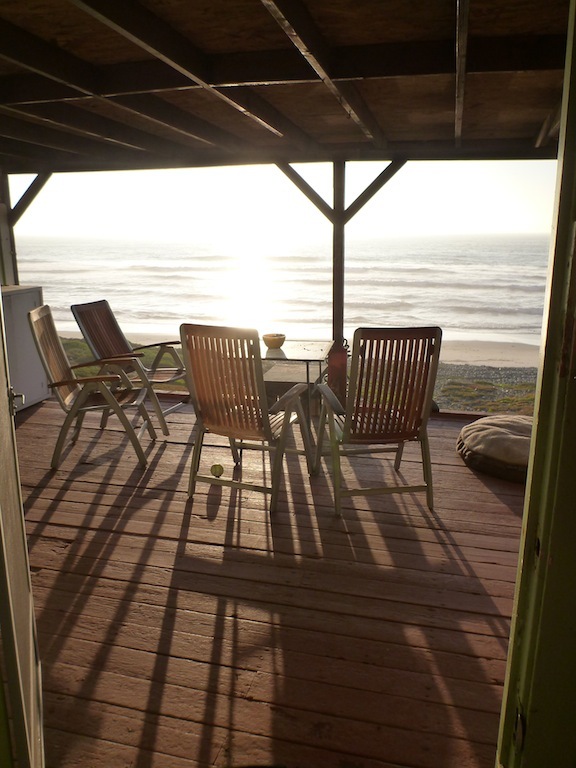 The beach house has a large wooden deck out the back with nothing between the deck and the ocean but sand. Mike’s rent is $400/month which includes a free sunset every evening and the sounds of waves crashing 24/7. Mike is very proud of four things: 1) the fact that he does not own a TV or a computer, 2) his two dogs, 3) his barbecue skills, 4) His Ducati motorcycle. The next morning, after coffee and a clean up, I thanked my gracious host for both the hangover and the hospitality, and I was off to Ensenada. 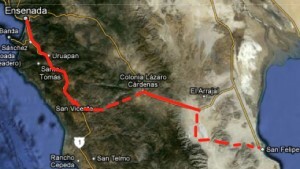 It was about 90 km from Mike’s house to Ensenada. I rolled in about 3 PM and then spent the next two hours trying to find the place I would be staying, “La Casa del Ciclista” (LCDC). People often ask me where I sleep each night on this trip down to Colombia. Obviously, between towns and cities, I will be camping. But what about when I get to a city that I want to stay at? When I can stay with friends, or friends of friends, I will, but even I won’t have a friend in every city I’ll be passing through. In Central America, I have it on good authority that you can stay with the firemen at the fire stations. I’ve also heard that you can still invoke La Obligacion with some of the churches in Latin America and be given a place to sleep. Finally, there are online hospitality exchange networks like couchsurfing.org, bewelcome.org, tripping.com, globalfreeloaders.com, and hospitalityclub.org, where you can find a stranger that will let you stay with them for a few nights. Failing any of the above, or if I just feel like a night to myself, there are hostels and hotels. 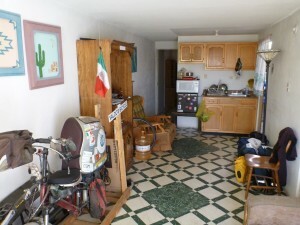 I found La Casa del Ciclista on warmshowers.com. No, not golden showers you sickos, warmshowers! Warmshowers.com is a specialised hospitality exchange network that is just for cyclists. In any case, the LCDC is a very generous offering and, judging by the guest book that everyone is encouraged to sign, it is one that is truly appreciated by everyone who stays here. I took some time to flip through the pages, partly out of curiosity, but also because there is a good chance I will be bumping into some of these people over the following months. The pages are filled with adventurous spirit. I managed to find where Ruben (the Spanish guy I met my first day out of San Diego when I was going north) signed. I also noticed that everybody and their dog seems to have either a blog, or a cause, or both. I was particularly impressed by Shirley and Yannick’s adventure though. They signed the book 11 days ago, and they are on the third leg of their “Trans-continental Triathlon”. They kayaked 2,000 km from Juneau, Alaska to Seattle, Washington; hiked 4000 km from the Canadian border down to Mexico on the Pacific Crest Trail; and now they are cycling 22,000 km to Ushuaia, Argentina! Of course, they have a blog too: http://blog.travelpod.com/travel-blog/hobos/1/tpod.html ! This brings up a point I’d like to make: This international tour cycling community I’ve just become a part of doesn’t do things by halves! 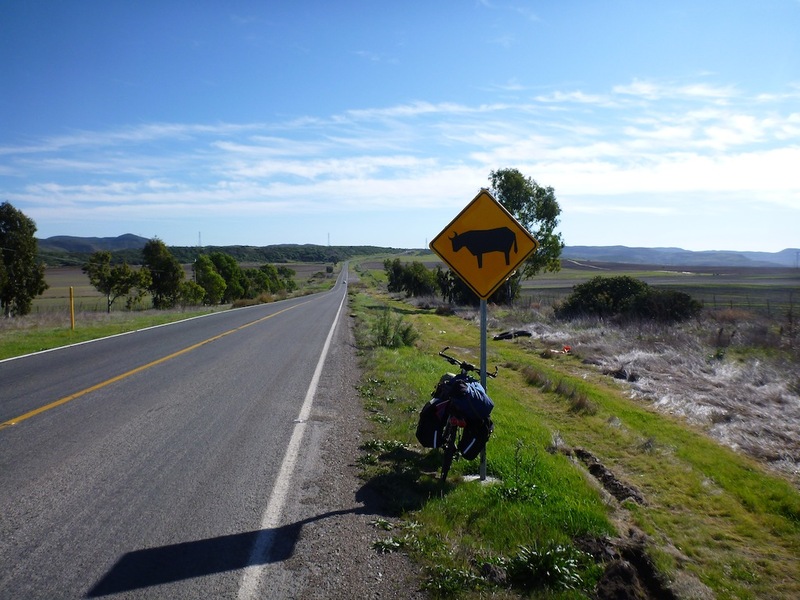 If I talk to anyone else about my trip to Colombia, the comment is: “That’s a long ways!”, but talk to another touring cyclist and it’s “Why aren’t you going all the way to Argentina?”. Um, maybe its the 12,000+ kms?! Ensenada is my first official “port-of-call” in Mexico. Whenever I’m entering a new country, or starting a new trip, I like to have a first port-of call – a place where I can just chjll out for a few days and settle into my new surroundings. It’s like spending time in a cultural decompression chamber. With not much to do, and the whole adventure still ahead of you, those first days are like your little personal holiday before your holiday. You get to just enjoy, stick your toes in, feel things out, and take care of a few errands. Get department of immigration address from tourist information. Ensenada is a nice enough town, it’s main industries are fish processing and tourism, but ever since the US Government issued a travel warning to Mexico (I believe in 2009? 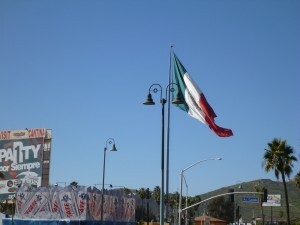 ), the number of tourists have plummeted, a trend that applies to all of Baja California and most of Mexico. I had no interest in going to a tourist craft market this close to the border or wandering along the tourist front streets and turning down people trying to sell you jewelry and souvenirs, so I left that to the cruise ship passengers and instead went and got some more tacos pescado, tacos adobada, and quesadillas en el estilo de empanada from the dusty back streets. I got everything done on my list by the end of the second day, so I just had one more thing to do before I moved on from Ensenada. I had to get a beer. Not just any beer though. In my research, I had discovered there was one craft brewery (Cerveceria Artesenal) in Ensenada, and I knew it would be shameful of me to leave Ensenada without stopping in at Old Mission Brewery to try a pint.. or two. I ended up spending that night barhopping around Ensenada with Paul, the owner of Old Mission Brewery, and fellow brewer Hector AKA “Chébuki” who runs a brewery school of sorts called BierLab. 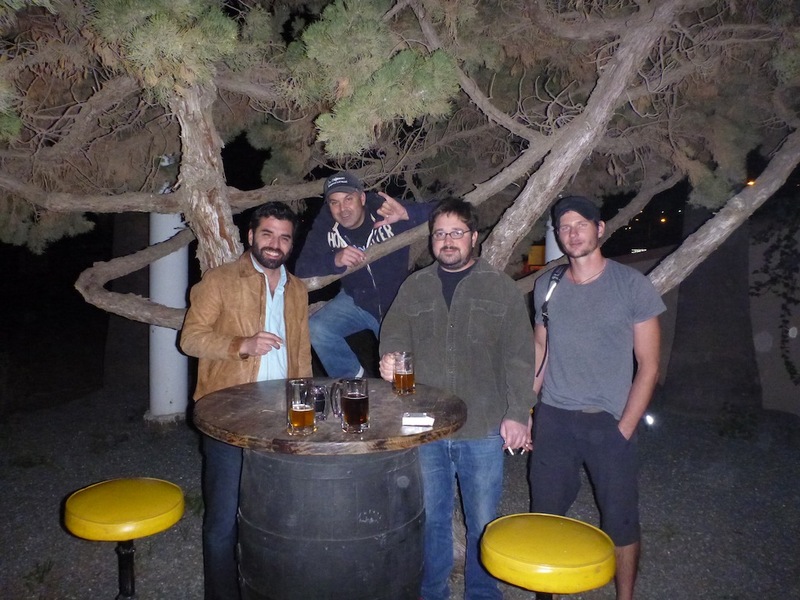 Once I had met virtually every brewer and home brewer in Ensenada, and tasted every beer they’ve ever made, we switched to drinking 60 cent bottles of Victoria beer by the bucketful until 4 A.M.. Good times. By the way, if you ever make it to Old Mission Brewery, try the Red Agave I.P.A. – it’s phenomenal. 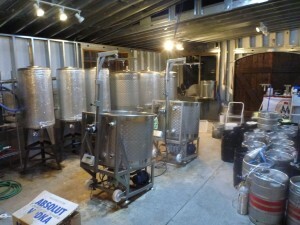 Or, the ladies might prefer the “beertini”, the Old Mission Wheat Beer with apple extract mixed in. It goes without saying that I was in no shape to get on a bike the next morning, so I slept in late and nursed my hangover. Today, I head for San Felipe, it will take me 3 to 4 days to get there as I plan to take Tony off the beaten path and spend a couple of days off-roading it across the desert. Yes, Mom. I’ll be sure to take plenty of water me. Your blog is just way too fun to read! It is extremely interesting! And I am enjoying it vicariously tremendously!! Yes, definitely be sure to drink plenty of clean water. Stay well and safe as always! Hey Paul! I’m doing great. After a convoluted path across western Mexico, I’ve finally made it to Mexico City.